The historic sites and museums of Frederick County provide visitors with a living reminder of our grand past. During the Civil War, Frederick was fiercely contested ground with numerous skirmishes and exhaustive troop movements accompanying the nearby battles of South Mountain, Antietam, Gettysburg and Monocacy. Today Frederick tells the story of a town divided and the care its citizens gave to wounded soldiers from both sides of the conflict. Three of Maryland&apos;s Civil War Trails (The Antietam Campaign, The Road to Gettysburg and Attack on Washington) pass through the county. Download the Heart of the Civil War media kit here. The very roots of religious tolerance can be traced to Maryland, so it&apos;s no wonder Frederick County is home to a variety of religions and historic houses of worship. Frederick city&apos;s picturesque cluster of church steeples was distinguished in John Greeleaf Whittier&apos;s poem, The Ballad of Barbara Fritchie. He wrote, "The clustered spires of Frederick stand, Green-walled by the hills of Maryland." From the C&O Canal, to the Blue Ridge Mountains, to the untamed beauty of the Potomac and Monocacy Rivers, Frederick County offers a wide range of recreational activities. 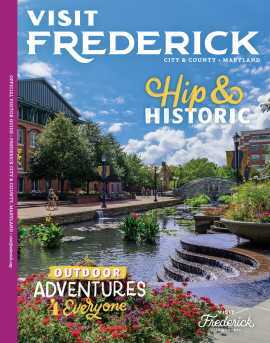 Frederick is recognized as an Arts and Entertainment District. Visit the nationally acclaimed Community Bridge Mural, where an artist has transformed a plain concrete bridge into a permanent illusion of an old stone and ivy covered bridge; a must see! Frederick County is home to many unique restaurants, including many wonderful privately owned establishments. Many restaurants in hip and historic Downtown Frederick, which is fast becoming a culinary destination, offer great weekend musical entertainment following the dinner hour. The foothills of the Catoctin Mountains are truly spectacular as the leaves change color. Leaf peekers are rewarded for their efforts with healthy doses of vibrant colors from late September to mid-October. You are invited to discover some of Frederick County&apos;s best agricultural bounty, its unique wineries, breweries, and distilleries. Dogs never have to go far without a drink, treat, and warm welcome when visiting Downtown Frederick. “My dog’s Diggin&apos; Downtown Frederick” stickers, water bowls, and dog-friendly fountains abound, while dog-friendly business owners offer treats for pampered pooches. Throughout town, you can easily identify dog-friendly businesses by the decals in the windows and stop in for some of these treats. Frederick County has much to offer for the under 18 set. In addition to our traditional attractions, tours and parks, you’ll find dozens of first run movie theaters, special events intended for youngsters, and a variety of specialty stores your kids (and you) will love. Downtown Frederick boasts over 200 antique shops, many within easy walking distance of each other. Our specialty retailers have offerings to satisfy a variety of interests. Frederick County is also home to unique clothiers, home furnishing stores and jewelers.